Facebook is rolling out the ability to send private messages with stickers — cute, pre-made, sometimes animated images — from its website. Facebook launched stickers on mobile in mid-April, but now the web chat smiley button reveals a basket leading to the web sticker store where you can choose from 16 free packs to add to your repertoire. Stickers could keep Facebook users from straying to other messaging mediums. 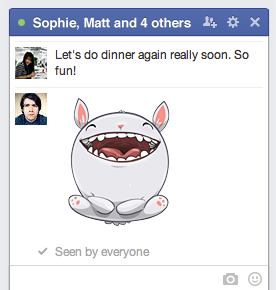 However, Facebook’s sticker progress could slow down. I’ve learned that Sophie Xie, the designer who started the Facebook stickers initiative at a hackathon and was their product designer and art director, has just left the company. Stickers for the web was one of her final contributions, which is why she appears in the screenshots below sent out by Facebook PR. Xie had only been with Facebook since 2012 but her departure is a significant loss for the company, whose stickers team will have to carry on without her. She’s now working on a bespoke hyper-local location app. Despite calling it a Sticker Store, for now Facebook confirms that it won’t charge users for sticker packs the way other messaging apps like Line and Path do. While it worked with Universal Studios to create a branded sticker pack for the new Despicable Me 2 film, Facebook says it also has nothing to announce regarding the potential for sponsored stickers that brands might pay to have added to the store. The store also doesn’t appear to include any new sticker packs. That doesn’t mean stickers won’t make Facebook money. The fun little visual communication tools could be reason enough for users to stay with Facebook Messages rather than choosing Google Hangouts, the new unified chat system that combines Google+, Google Messenger, and Google Talk (Gchat). Hangouts has no stickers as of yet. 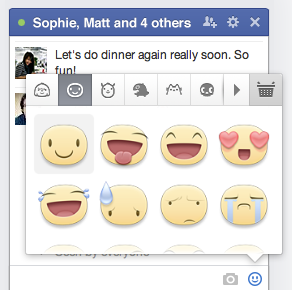 Facebook can monetize engagement from messaging and stickers both directly and indirectly, especially on the web. Users might open Facebook to respond to a sticker message, but end up browsing the news feed where they see ads while waiting for the conversation to progress. Meanwhile, the more you message, the more Facebook knows about who you’re closest with. It can use that data to refine its content relevance algorithms and show you feed stories about people you care most about. Facebook is serious about stickers. It’s brought in top-notch outside designers (like David Lanham who turned Mark Zuckerberg’s dog Beast into his own pack) to make sure it has some of the cutest stickers around. It’s also worked with compassion researchers at UC Berkeley to create a new generation of animated smiley emoticon stickers that more vividly convey emotion than the little unicode or text-only emoticons you’re used to. It all might seem silly, but stickers could be a powerful differentiator for Facebook and others in the sea of messaging apps.With SMS dying out, whoever claims the text-messaging throne could be heir to a ton of traffic.